Last night, I got back from my second ever Birdfair, feeling tired and, as expected, a little bit depressed that I would have to wait another year for the next one. Before I begin, I should probably give a quick description of the event, in case anyone has never been before. It is an annual fair held in August, that is bird-themed (with some other wildlife thrown in too). 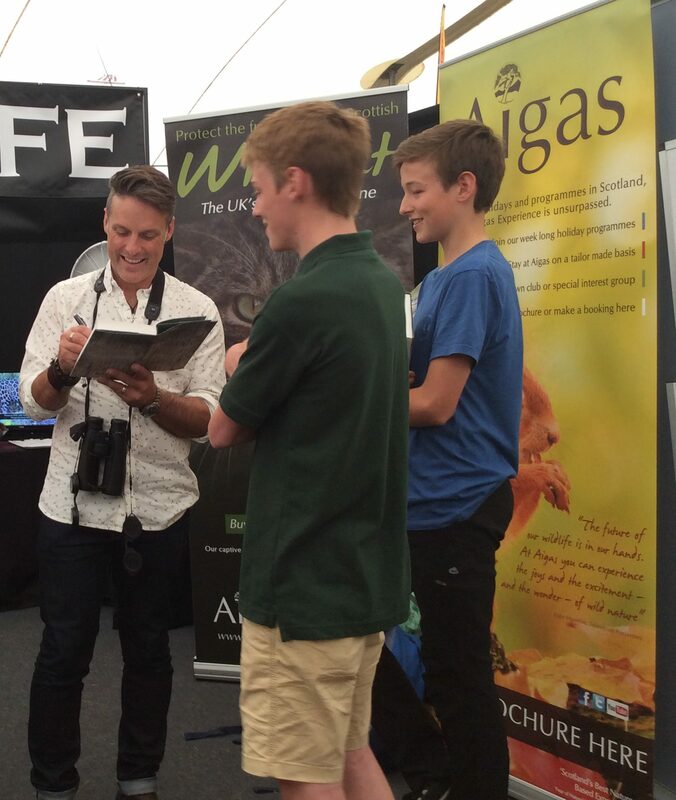 There are stalls held by wildlife watching holiday companies, conservation charities, camera and optic brands – and you can test out all of the equipment too! 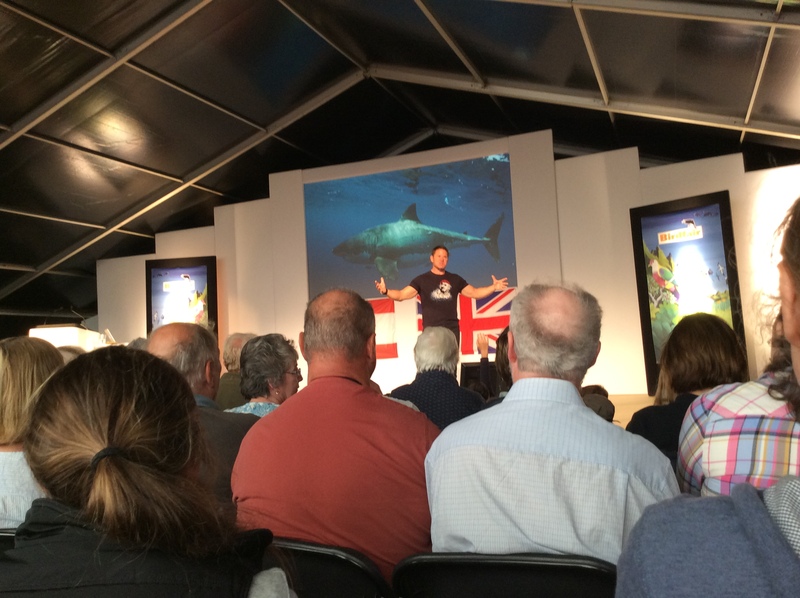 There are also talks given all through the day at different marquees, from both celebrities and experts in their fields, on a variety of topics ranging from wildlife politics to photography and twitching. It started with my alarm waking me at 5.00, a hurried last minute pack and a 3 hour car journey up to Rutland. After filtering through the Birdfair traffic system, I jumped out the car with my entrance ticket,and swam through the crowds find the RSPB stand. I had volunteered to spend the first two days of the Birdfair helping the RSPB, but I didn’t know exactly what my role entailed. But this was soon explained to me – I was signing up children to the Bug Safari and Pond Dipping walks that would take place at regular times throughout the day. Easier said than done… for every one child there were flocks of adults, and there were gaps of up to 10 minutes between children passing through. This wasn’t so much of a problem on Saturday and Sunday, but on Friday it was very difficult to muster enough families to make the walks viable. However, in the meantime, it allowed me to spend the quieter periods chatting to people. (A lot of people – too many to mention) As well as the many who I saw but sadly didn’t get the opportunity to speak to. In my time off the stand, I went to a talk : the Politics of Wildlife Protection in Britain talk, hosted by Mike Dilger and featuring Mark Avery, Anneka Svenska, Dominic Dyer and Chris Luffingham. It highlighted some of the major issues in the politics wildlife protection, and how we can make the situation change. It was great to hear these people speak first hand, after not being able to go to any of their other talks around the country for the past year, and to learn more about how we can all make a difference. I had lunch with my friends from Speyside Wildlife, and got to catch up with some people I hadn’t seen in a year – not surprising as they are based in Scotland. After finishing signing up children for the final walk in the afternoon, I decided to join Dr Roger and Rosie Key on the final Bug Safari of the day, one where Mike Dilger was accompanying the group! I had a lot of fun with the nets and pooters, I’m not in the least ashamed to admit, and we caught many different species living in the meadows. Butterflies, Damselflies, Grasshoppers, Froghoppers (the insects responsible for cuckoo spit on plants), flies and wasps. My personal favourite was the Thistle Gall Fly, that lays its eggs in the flowerheads of thistles, causing a gall to grow on the inside. By gently squeezing the heads of thistles at this time of year, you can feel the difference between the soft, unimpregnated heads, and the hard ones that contain the galls. The flies themselves have beautiful zebra-striped wings. I believe a Roesel’s Bush Cricket was also caught, and I had never seen one of them before either. After helping clean up all the pooters and nets for the next day, and caught a lift back to my accommodation for food. Should Wildlife Film Making Be More Than Just Visually Stunning Armchair Entertainment? 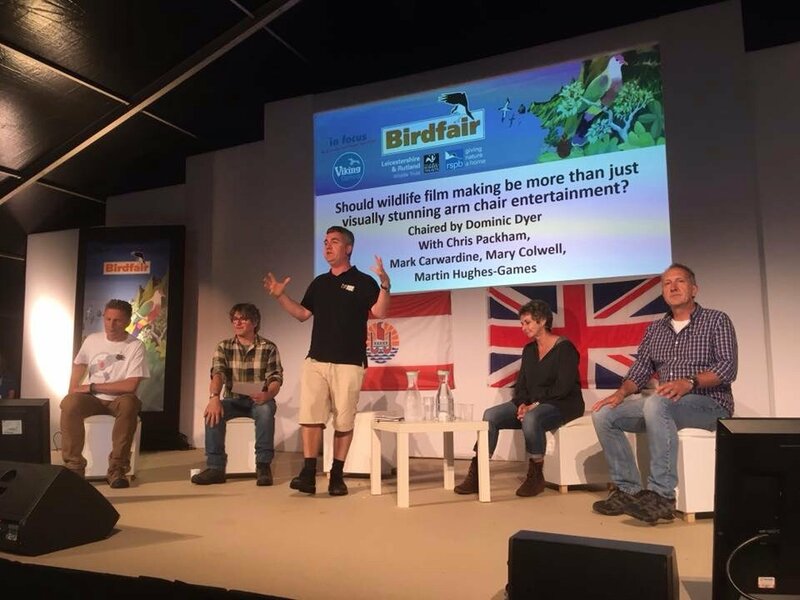 It was chaired by Dominic Dyer, and also featured Chris Packham, Mary Colwell, Mark Carwardine and Martin Hughes-Games. I also happened to know that Carla Fraser, my ex-acting teacher (I’ve had to stop recently) was going to make an appearance, but I wasn’t sure what form that would take. The talk took the form of a kind of debate, where for the first half each of the speakers gave a short speech about their opinion on the matter. Martin Hughes-Games, of course, had written an article that became quite well known, and a little controversial, criticizing the way that documentaries such as Planet Earth 2 were giving the impression that the world was in a far better state than it was, and lulling the public into a false sense of security when it came to the environment. He said much the same in his speech, and I found myself agreeing with him – although nature enthusiasts realise the predicament the planet is in, the general public may find themselves less inclined to take action when they see footage depicting an ideal, fantasy planet where wildlife roams free in abundance. He also described the situation most BBC producers face, and how it is very difficult for them to get approval for this kind of documentary, and they are under pressure to carry on creating these stunning, idealistic documentaries that are so popular with the public. 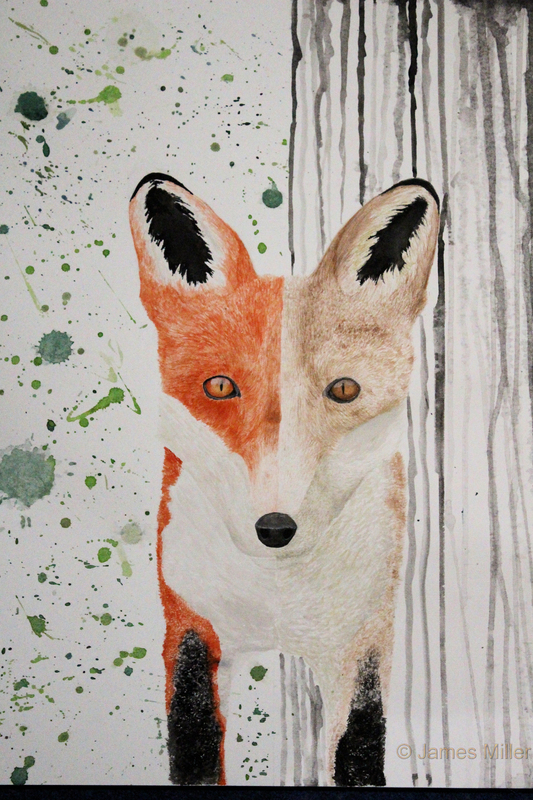 Chris Packham backed up this opinion, but additionally pointed out how social media, as well as television, can now be used very effectively to spread messages to the general public – especially younger people. He has demonstrated this quite effectively in his recent projects in Malta and Cyprus, raising awareness of the slaughter of songbirds by filming short videos then posting them online. Mary and Mark were on the other side of the debate, and took the opinion that programs like Planet Earth 2 were doing a very good job, and that more people need to be inspired by the sheer wonder of wildlife, rather than be depressed and hopeless at the mess it is in. I can appreciate this point too – many, many young people watched Planet Earth 2, which engages them with the natural world when they wouldn’t otherwise. Mary also pointed out the potential for radio to do more natural history programs again. 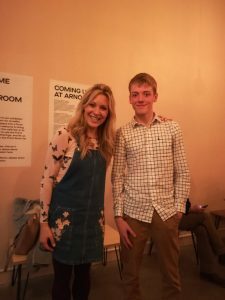 And, just before the interval, Carla popped up on stage, and spoke to everyone about her short film that she made. She showed me this film before I stopped acting classes, but it was great to see everyone’s reactions to it (they were very good reactions indeed!). During the interval I had a chat with her – it had been over a year since we last spoke!But before long she had to return to the stage along with the rest of the panel to answer some questions from the audience. Also at this point, a boy came up to me and told me that he follows my blog, and really enjoys reading it. Thanks very much, I really appreciated the compliments, it means a lot. If you or any other young naturalist reading this blog finds that they aren’t on my ‘links’ page , and wants to be, please don’t hesitate to contact me using the side bar or comments section beneath. I’d really be interested to see other people’s blogs as well. The evening finished off with an instructive but inspiring summary of how everyone can make a difference. 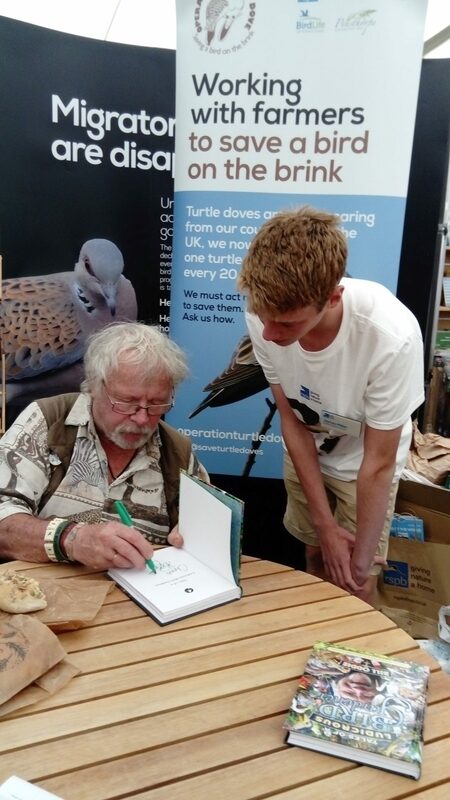 Afterwards, I went to say goodbye, but got more than I had bargained for and got introduced to Tim Appleton, the founder of the Birdfair! On day two, I didn’t succeed in waking my family quite as early as I had hoped, but I still managed to reach the fair just as my shift was starting. At 11.00, I rushed off to Chris Packham’s (together with Ruth Peacey, Ruth Tingay, and staff from Birdlife Malta and the the Committee Against Bird Slaughter) talk on ‘Tales from the Frontline of Conservation’, which is all about the situation in Malta and Cyprus, and what can be done about it. Unfortunately for me, but fortunately for the cause, the marquee was declared full just as I was halfway through queuing up, and so I was forced to retreat. In the end I decided to return to the stand and swap shifts with Hannah, and instead went to Mike Dilger’s talk on wildlife presenting. It was really interesting, and provided a useful insight into what life would be like if I chose to go down that career path. I returned to the stall and continued my job, while the staff set up a chair and desk for an author to do a book signing. Alex White then turned up and said hello, and we got talking. 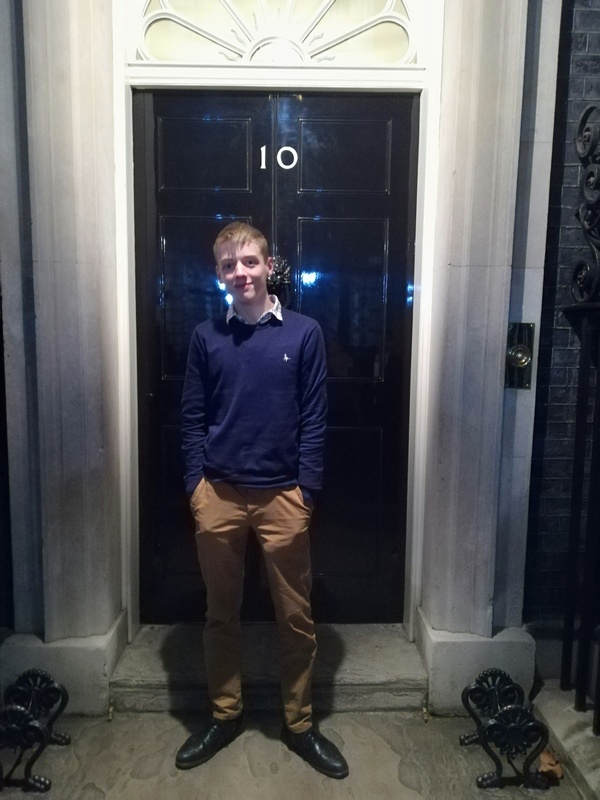 He’s another young naturalist, who also is interested in badgers – you can check out his blog on my links page. Sami Sankey then joined the conversation – again check out my links page. While we were doing so, my parents tried to inconspicuously photograph Bill Oddie, but we got in the way. The observant of you may have also noticed Anneka Svenska was also inadvertently captured. I then rushed off to Duncan MacDonald’s talk on Autumnal Wildlife of Speyside, and the tent was packed out, with people standing at the back to listen. As always, an entertaining and interesting insight into the highlights of highland wildlife at this time of year. I went and bought some lunch, then rushed to get a seat at the Bird Photographer of the Year Competition and ceremony. Needless to say, the photos were all absolutely stunning, totally breathtaking. The audience couldn’t help audible sighs – that’s how amazing they were. My particular favourite, I have to say, was ‘Yellow Between the Stars’. Check the photos out – they’re unmissable. Finally, I headed off to Marquee 8 at 5.30, for the annual AFON meetup and photo. Here I saw many old friends, and met several new ones. As we were chatting, Tim Appleton walked past, accompanied by… Steve Backshall and Helen Glover! After saying some last goodbyes to the AFON lot, I decided to be safe and get in the queues early, so I would get a reasonable seat for Steve’s talk. I had no idea what the time was, but I reckoned it couldn’t be too long until the talk started. As I approached the marquee, I saw a massive queue had already formed, stretching all around the side of the marquee and back . I joined the very back (that’s how queues work) and waited for the marquee to open. I waited a long time, and it was cold, even with a fleece on. It must have been about 40 minutes before they decided to open up the marquee (to be fair, that was the time that the talk started), and by then, the queue had doubled in length. Luckily, I managed to grab a spare seat quite close to the front. 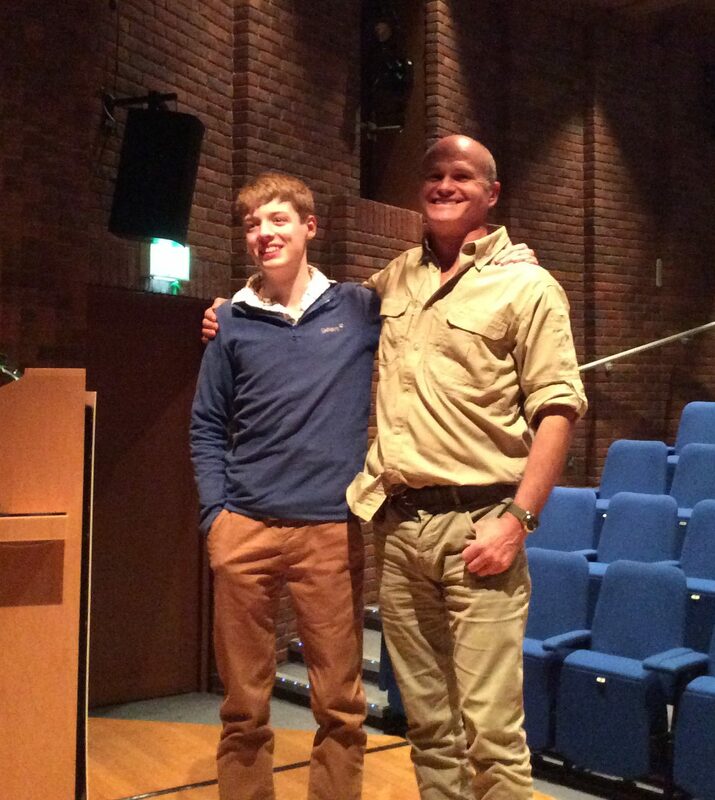 And, not long after, Steve Backshall and Nick Baker walked up onto the stage, and proceeded to deliver an entertaining interview on Steve’s early life, his favourite encounters, and his recent kayaking challenge to raise money to save Bornean forests with Helen. The evening finished off with questions from the audience, and at least half came from the young people sat at the front. It shows how much of an inspiration he is to younger generations, and how we have programs like Deadly 60 to thank (I remember having watched every episode, and re-watching quite a lot). As it ended, it was announced that both Steve and Nick would be signing books at the stage afterwards. I checked my wallet to see how much I had brought with me. £20. 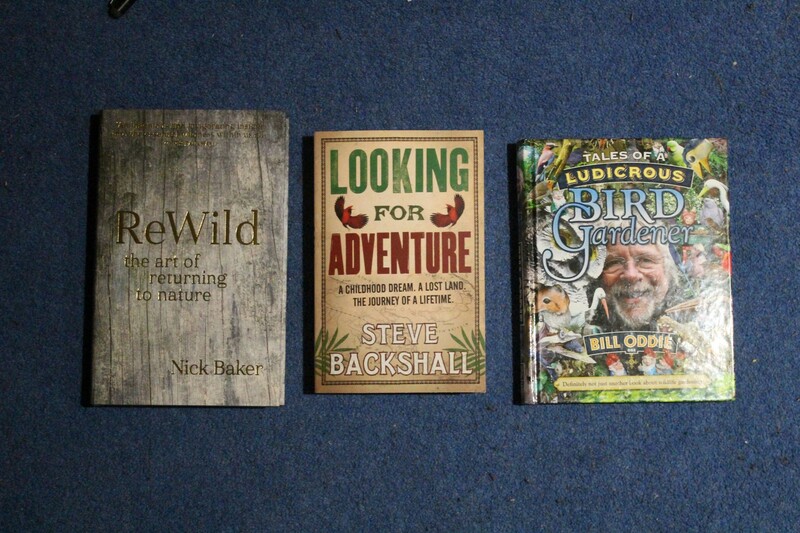 After a good twenty minutes, I reached the front of the queue, and found that Steve’s books were seven and nine pounds respectively, and Nick’s seventeen (it was a nice hardback). I concluded that I could buy a book of Steve’s for myself and for my sister, and borrow some money from my parents to buy Nick’s book tomorrow. As I approached the table where they were signing books, I could see that everyone was buying Steve’s books and not many purchasing Nick’s. In fact, I think Nick ended up signing more books of Steve’s than his own. So as I walked past him I wore a suitably sheepish face, and told him I planned to buy his book tomorrow. Then, feeling slightly less guilty, I received a creative signature from Steve, but unfortunately no photo because my phone is incapable of such a technologically demanding task. 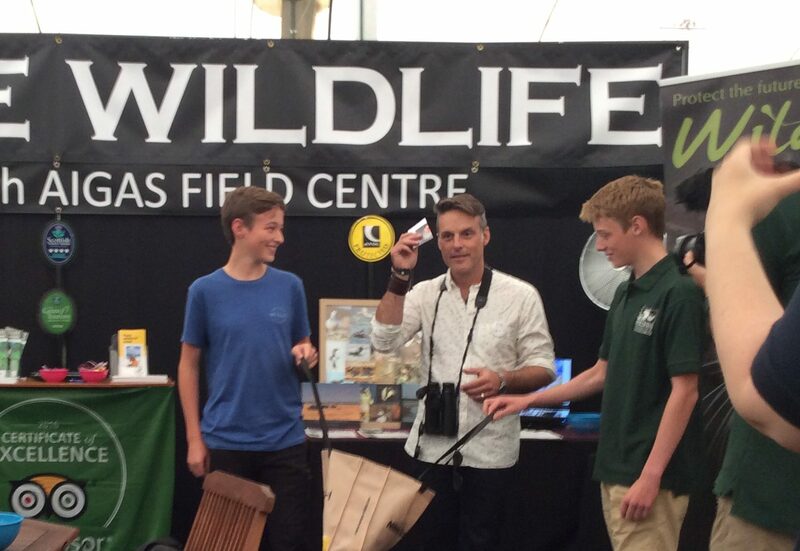 And that was the end to an awesome day 2 of Birdfair! On day three we got going later still, as there was no longer the RSPB volunteering incentive for my parents. However, we did arrive just in time to catch ‘Ask the Experts’ with Miranda Krestovnikoff, David Lindo, Martin Hughes-Games, Ruary Mackenzie-Dodds, Dawn Balmer and Nicholas Watts. Many interesting questions were asked, and many interesting answers given. I found Ruary’s description of the complexity of a dragonfly’s wing particularly intriguing. We stayed on for another Steve Backshall talk – my sister didn’t see him last night, and I saw it as my brotherly duty to accompany her, of course! Another great talk (he speaks very well – I was impressed). This time the talk was shark-themed, and described how sharks are really not as dangerous as most believe, the joy of swimming with sharks, and the threats that are posed to them today. I went off afterwards to purchase my copy of Nick’s book, but got a little distracted by the extraordinary selection of books they had for sale on the stand. By the time I’ve retired, I want a library like that. I had a wander around the fair for a bit, before returning to the events marquee for the much anticipated Pointless Birdbrain. It is much the same as the television quiz show, but is, of course, bird themed. 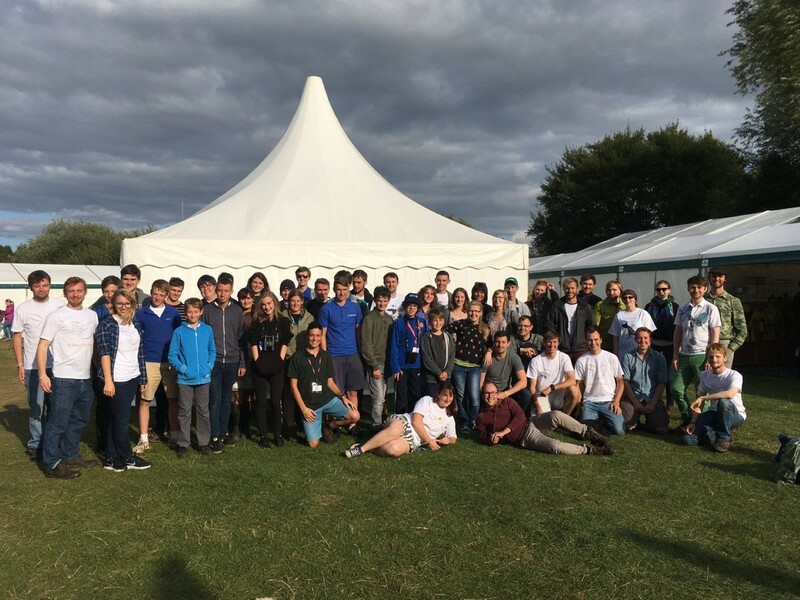 Miranda Krestovnikoff, David Lindo, Martin Hughes-Games and Nick Baker were all paired up with Birdfair volunteers to compete in a variety of rounds, from naming obscure cetaceans to unscrambling tree anagrams. In the end, Nick and his teammate Hannah claimed victory, and scored a pointless answer in the final round to win the prize (a selection of books I believe?). I then had some more lunch and a longer stroll around the fair with a friend, complimenting photorealistic artists (as well as those who made badger sculptures) and testing top-of-the-range scopes and cameras. Some were priced at over two thousand pounds so we were very careful when handling them! I remember one Olympus camera with a particularly impressive continuous shooting mode. After enjoying myself way to much with equipment I could never afford, I made my way over to the Speyside stand, for an event I had been particularly looking forward to. Speyside Wildlife launched this competition for the Birdfair, where a collage had been put together using different parts of 10 birds. The contestant had to guess what those birds were, and if their name was drawn from the pool of successful candidates, they were in for a £300 voucher, or a free guided day. Someone had to draw a name from that hat (or bag, as it turned out to be). And that person was… the one and only Nick Baker! 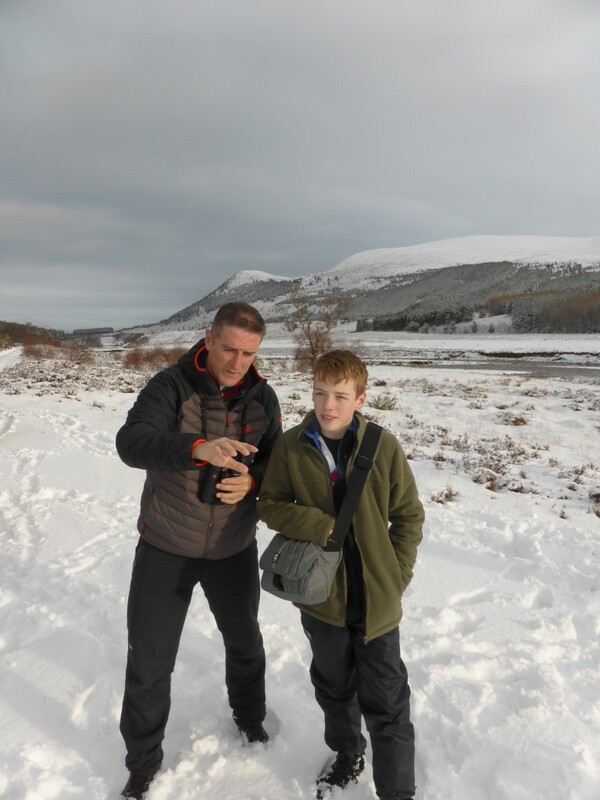 But apparently he needed some moral support in the form of two bag holders, and Speyside Wildlife very kindly invited Alex Bayley and myself to have that honour. And, when he turned up, that is exactly what happened! I got an introduction and a signed book for my efforts. 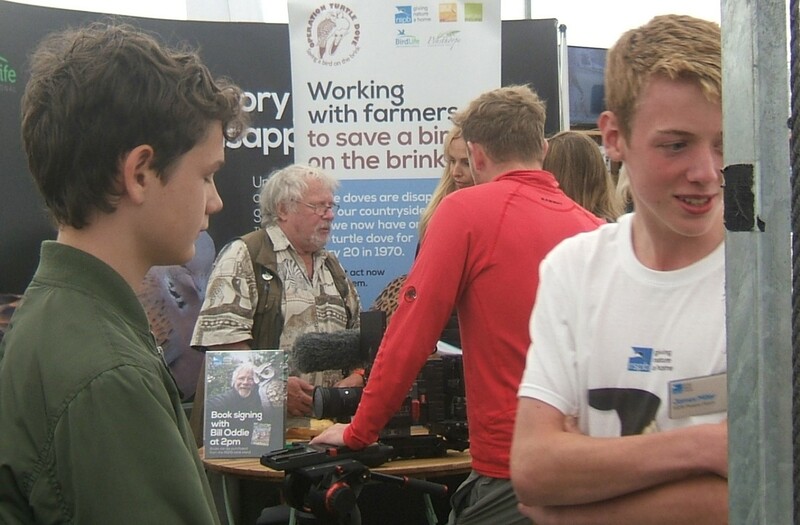 To conclude the day, and the weekend, I had a quick filmed interview on how I found the Birdfair. To put a long, 2500 word story short, I found it very good indeed!